The Hayden Holy Grail has been designed to take any surfer on a journey within their surfing ability. It maintains flow and run but brings some very responsive curves and feeling later in your turns. The Hayden Holy Grail is perfect for all types of waves from flatter faced waves to steep faced waves. It is your all-around go-to board. Hayden achieves this by narrowing the nose width while extending the length of the rail line ahead of your front foot. This gives you a “greater connection” for carving. Hayden throws in the added curve to ensure it will also fit in the tighter curves of the a wave. Next Hayden throws in more surface area on the tail of the board to increase planing speed in smaller and flatter waves. The Holy Grail’s tail is side cut to introduce an aggressive curve to the rail line of the board. This helps when you are on rail and late in your turns. Hayden has also added an increased tail lift to compensate for the wiser block on the tail. The flatter rocker profile of the Hayden Holy Grail is designed to give a very fast and continuous speed while on the board while giving the best paddle power. Although the Hayden Holy grail is a shorter, wider surfboard and carries more volume, the surf board design does not sacrifice any performance. It is the perfect board for epic days in the warm water of South Florida but versatile enough to throw in a board bag (SHOP BOARD BAGS) for that next surf trip. And so Hayden, who is something of a surfboard-obsessed mega nerd, thought long and hard about Ben’s conundrum. What he came up with looked like a beaver-tailed 9’6, with fins starting much further up the deck than usual and a side-cut in the back third of the board. After a few test runs, Hayden knew with a few adjustments that he could meet the challenge to create a surf board that would ride fast in a horizontal plan but also have the ability to care and turn when on a rail. So, he designed a surfboard that was wider and flatter through the front half while slenderizing the tail to increase stability and hold on steeper sections of a wave. Hayden was able to engineer a board has amazed many. *Rider weight is based on board volume and novice to intermediate rider skill level. FutureFlex represents the very latest in surfboard technology and design. The construction process combines a stringerless, high-density custom shaped EPS core laminated with biaxial fiberglass, epoxy resin and a parabolic carbon fiber frame. The carbon fiber frame within the laminate is the key to the performance of these boards. Designed to maximize speed and drive while minimizing twisting, FutureFlex boards essentially store and release energy as the surfer transitions through a turn. 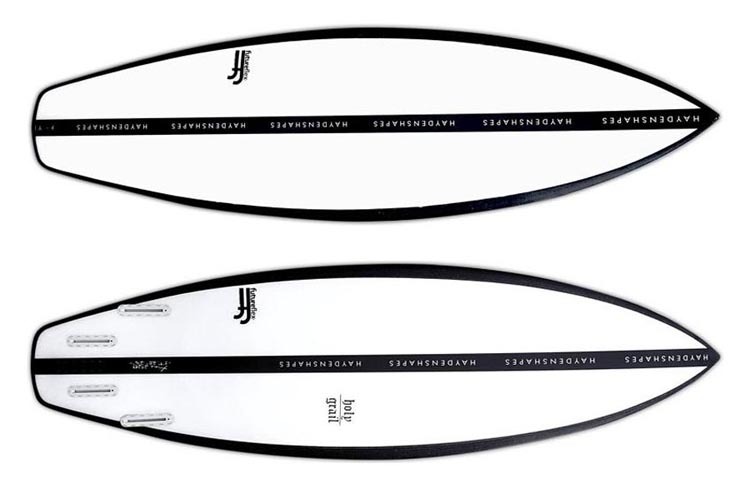 The result is a fast and lively, highly responsive surfboard that’s perfectly geared for high performance surfing. “It’s the first kind of grovel board, that doesn’t feel like grovel board,” Dion told me. “I’ve been riding those shorter, fatter boards for such a long time that I forgot what it was like to do a proper turn. This board keeps the speed and pop that you’d want for airs, but when you put it on rail, it’s like a shortboard — but better. I’m kind of freaking out… This might actually be the Holy Grail”.